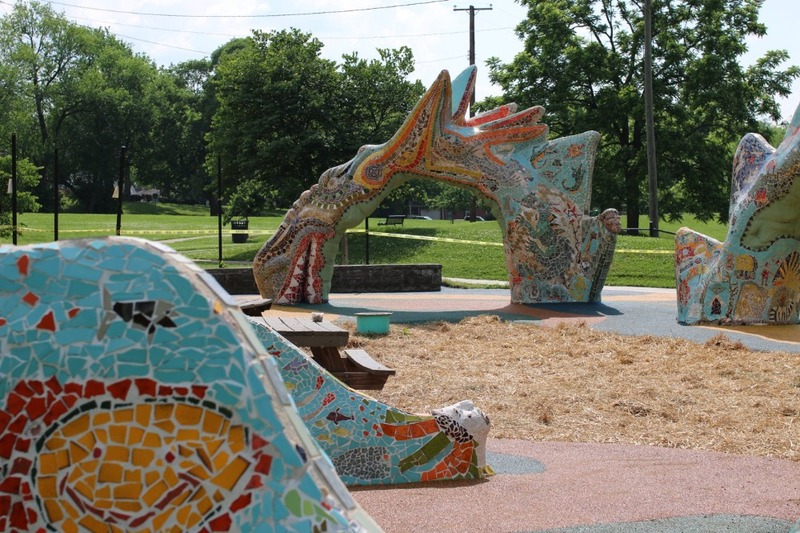 Whether you grew up playing on it or bring friends and family to marvel at its majestic form, the mosaic dragon sculpture in Fannie Mae Dees Park serves as a beloved touchstone for generations of Nashvillians. We come here to play, run and imagine. We come here to gather, relax and restore. Now Nashville’s dragon needs our help. Its beautiful tilework is sluffing off, and there are large cracks forming in its high arches. This is due to the extremes of weather and thermal forces over time. The Hillsboro-West End Neighborhood Association in Nashville, Tenn., is launching a campaign to raise funds to restore the dragon. Our goal is to raise enough money for periodic maintenance as well, so this unique centerpiece to one of our city's great urban parks can continue to entertain and inspire future generations. Our goal is to raise $200,000, and we need your help! Installed in 1980, Nashville's dragon is the result of an amazing community project led by the late New York artist Pedro Silva. Hundreds of volunteers, of all ages and from various walks of life, came together to create the tile vignettes that form our dragon’s colorful exterior. They weren’t experienced artists. They simply had the desire to take part in creating a unique piece of art that would serve as the backdrop for a children’s playground, and an adult’s oasis, in the heart of the city. Now let's come together again and Save Our Dragon. The Hillsboro-West End Neighborhood Association, a 501c3 nonprofit organization, was founded in 1975 on the principles of community, preservation and engagement. An early endeavor was fighting the construction of I-440 for 10 years until achieving placement below grade. The neighborhood got its start in 1910 when a new streetcar line out to Blair Blvd. sparked a wave of home building. Today, HWEN boasts the largest cohesive collection of early 20th century houses in all of Nashville. It also is home to Fannie Mae Dees Park (aka: Dragon Park) and Nashville's iconic dragon sculpture. HWEN is listed on the National Register of Historic Places, and much of it is protected by Conservation Zoning. Our beloved Dragon has been saved! Thanks to you and nearly 1,000 neighbors and friends of the Dragon, the structure at Fannie Mae Dees Park reopened May 20, 2018. We could not have done it without you. Thank you! Now that the Dragon is open again, together let’s keep it open. The fact is that our Dragon is going to need ongoing care and maintenance for decades to come. So the Hillsboro–West End Neighborhood Association (HWEN) is committed to continuing to raise funds for this vital purpose. We are sure you will agree that our Dragon should never fall into such a sorry state of disrepair again. Please help us keep the Dragon safe and healthy by donating to this GoFundMe page or writing a check to HWEN/Save Our Dragon, P.O. Box 120521, Nashville, TN 37212. The two-year restoration was the result of a public–private partnership between the HWEN and Metro Nashville Parks and Recreation. We wish to recognize the generous support of our community’s leadership sponsors to Save Our Dragon. And nearly 1,000 neighbors and friends of the Dragon. THANK YOU! We met a major milestone in January 2018. Phase one of the Dragon’s restoration is now over. HWEN’s team of expert craftsmen repaired 100-plus major cracks, offsets and holes along the beloved 200-foot-long, 13-foot-high structure. It took 11 months of physical labor from our hardworking structural engineers. Our team has already replicated several mosaics, but there are 60 – yes, 60 – more to go. This is due largely to the indoor tiles that were used during the original installation in 1980. Not to worry; they are being replaced with durable, frost-resistant porcelain tiles, which are expected to make a big difference in ensuring a restoration built to last. Together let’s #SaveOurDragon! Thank you for your continuing support. To give, done to this GoFundMe page or send a check payable to Save Our Dragon to HWEN, P.O. Box 120521, Nashville, TN 37212. For those of you asking how you can help #SaveOurDragon beyond donating to the cause or sharing this page on Facebook, there will come a time when the community can get involved with the tangible work. We need to keep raising money for the needed materials to repair the dragon. We will keep everyone posted as we progress towards our goal of $200,000! 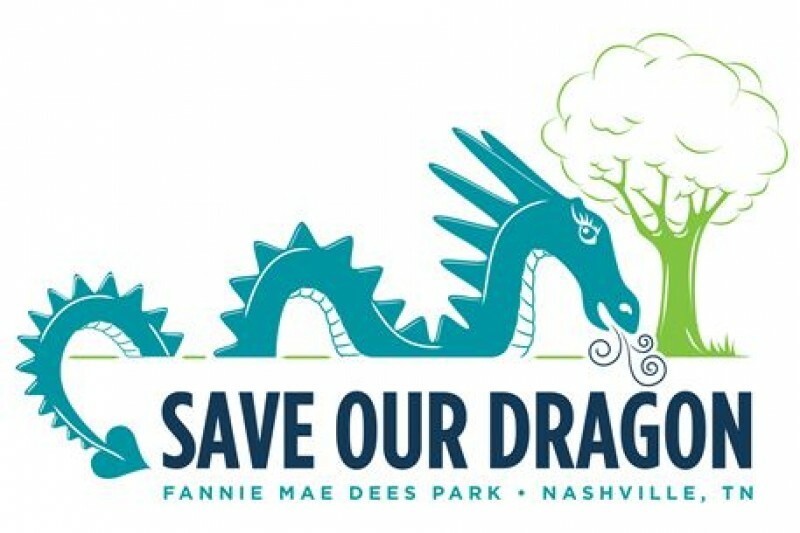 The Belmont-Hillsboro Neighbors (BHN) Steering Committee is excited to announce a $5,000 pledge to help save the Dragon at Fannie Mae Dees Park – and we challenge you to match half if it! The committee is willing to match donations up to $2,500 between now and Sept. 30 so we can turn their $5,000 donation into $7,500 total! We are challenging you to donate to this cause to restore the Dragon. With $2,500 of this pledge dependent upon our matching this amount in donations from the community, there’s no better time than now to donate. You can donate right here on the Save Our Dragon GoFundMe page. Please hurry! BHN is sponsoring this challenge match between now and Sept. 30 only. Giving today will make sure you double your impact. Do we have a designated repair plan and estimates for current repairs and future maintenance? Has anyone been chosen to do these repairs yet ? I'm interested to see who locally will be a good candidate for this. From SaveOurDragon Chair Jan Bushing: Many mosaic artists have given their time and expertise to examine the problems. It was determined that the problems were more than those seen on the mosaic surface. Hence, the restoration should be in two phases: Remedy the internal structural problems. Restore the mosaic art where possible and replace bare areas with new mosaics. Nashville's own Ross Bryan Associates, a premier structural engineering consulting firm, are analyzing the root causes for the major cracking and concrete deterioration. The Dragon is unique and they are developing a process to solve the structural problems without harming the mosaic art. Tony Silva, son of the Dragon's creator, Pedro Silva, has agreed to come to Nashville to restore the mosaics with the help of community volunteers when the structural problems are resolved. Tony assisted his father in the restoration of his father's mosaic art surrounding Grant's Tomb in New York. The siblings of Vanderbilt Children's Hospital are beneficiaries of this park! While they stay at Ronald McDonald House as their brother or sister gets cancer treatment, or a new heart, parents need a place to get away with the unaffected sibling. To feel normal... to feel free and refreshed outside of the sterile environment at Vanderbilt Children's. This is their getaway! Please help save the park! Local artists Sherri Warner Hunter could lead repairs with a group of volunteers much like it was done years ago. All the best! What about a fund raising event where school kids can bring pennies , have a cute slogan . Start with the neighborhood schools and then branch out. I would volunteer to help with that type project. Since these are gifts to a 501(c)3 organization, are they tax deductible? From SaveOurDragon Chair Jan Bushing in response to Chris Maynard's question below: There was only $25,000 budgeted for all of Fannie Mae Dees Park for the fiscal year. This funding is insufficient to cover repairs needed for the Dragon. We are hoping additional funds can be placed in the budget, but that is not a certainty. The repairs need to be started before we have another winter with rain, snow and freezing temperatures. If not, the problems will be even greater. Part of the wonder for me and many of my classmates is that we took part in adding mosaic tiles to the dragon when we were at Eakin. I hope the restoration effort will allow for this type of inclusive activity for another generation of children and those of us who are still young at heart. Hi I'm a sculpture conservator originally from Nashville, but currently in NYC. I'd love to have a reason to move home and use my expertise to assist with this magical place from my childhood. Our children and now their children have loved this park and the "dragon"